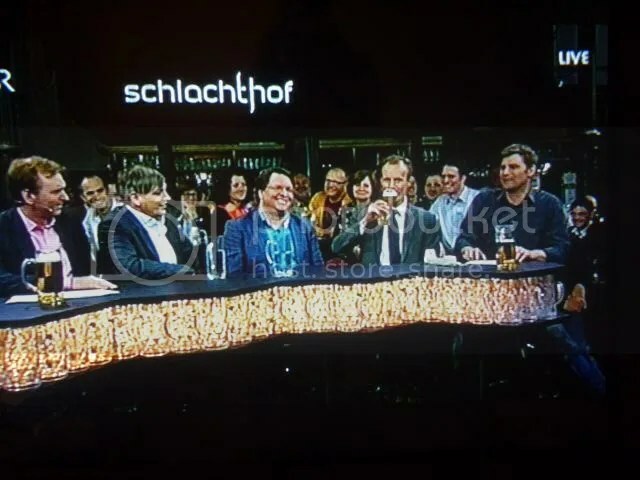 Bavarian Brews 24 – What makes a Bavarian talkshow different? Since I’m the one asking, you have probably guessed the answer. There was no Biergarten weather in Munich that afternoon, but it was perfecly pleasant for a stroll. Avoiding the main avenues around my flat, I came across an old graveyard. 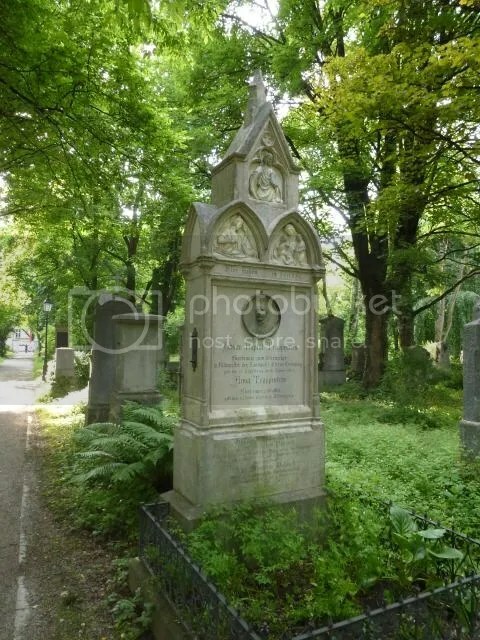 The Südlicher Friedhof is a beautiful place, where nature is slowly taking over. Crumbling memorials in marble speak of families long gone, ivy and other greenery creep slowly forward. Is seems like a long time since anyone was buried here, though some of the memorials are in better shape than others. A large gravestone stands just by the path, and the title catches my eye. Bierbrauer. 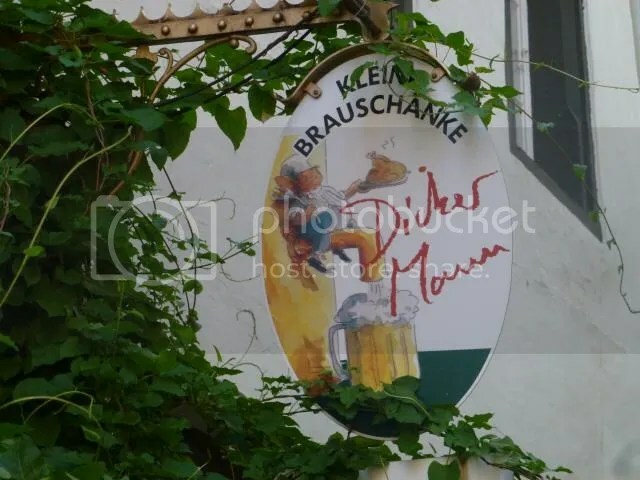 It even gives the name of the brewery, Bierbrauer zum Sternecker. Johann Baptist Trappentreu. Not only a brewer, but also a Rittmeister. He died in 1873, 77 years old, but someone has made sure his memory has not faded away as his neighbours in the cementery. The Sternecker Brewery was located in Tal, close to where the present day Schneider Weissbräu is located. According to Wikipedia, there is documentation of a brewery on the premises way back in 1557. 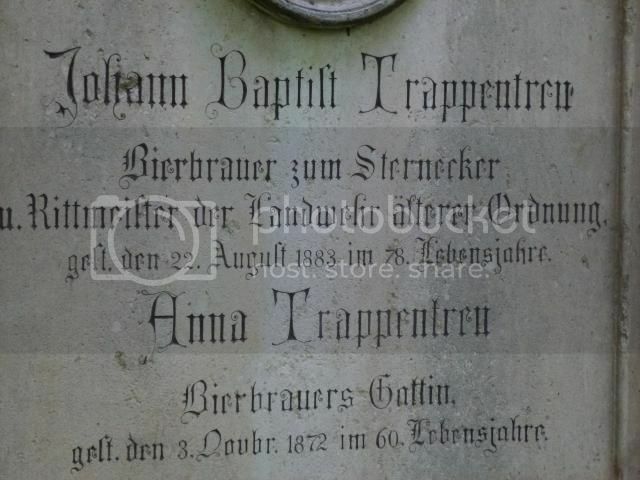 Long after Rittmeister Trappentreu had passed away, the brewery and its brewery tap got famous. 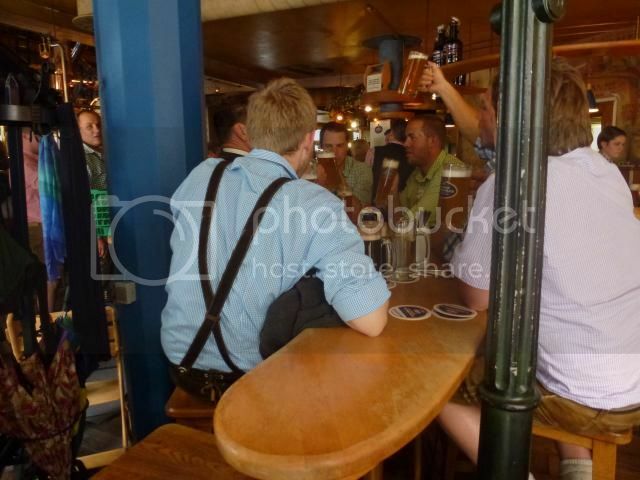 When you google Sterndecker Brauerei, most of what you get is Nazi memorablia. The Sternecker brewery was the venue for regular meetings in the Nazi party from 1919, and a party museum was established on the premises in 1933 by Hitler himself. The building survived the war, but the Gasthaus was closed in 1959 and the ground floor was used for shops. Today there is an autorized Apple dealer on the premises. But if you look down the alley on the side of the building, the Beer and Oktoberfestmuseum is down in the alley. In Sterneckerstrasse. So there is some kind of continuity after all. This is a beer blog, and I have no ambitions to make comments on world history or grave matters concerning the future of the planet. 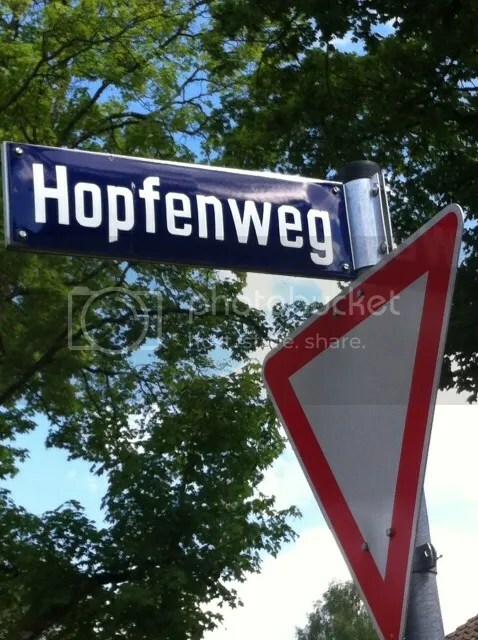 But sometimes the beer and the breweries are interwoven with history, in particular in Germany. You cannot pretend that there are dark shadows behind the present charm. This is not so obvious in Bavaria as in Berlin. But it is there if you look a bit more closely. Rest in peace, Johann. It is certainly not you fault that, almost 40 years after you passed away, you brewery was home to evil deeds. I have no wish to see the brewery rebuilt. But maybe someone should plant some hops by your memorial? 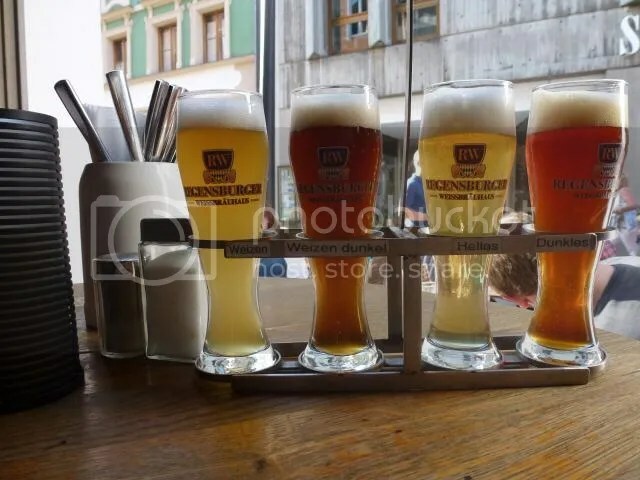 In the middle of the charming, pedestrianized and upmarket old town, the Regensburger Weissbräuhaus claims that there has been a brewery on the premises for centuries. Anno 1620. 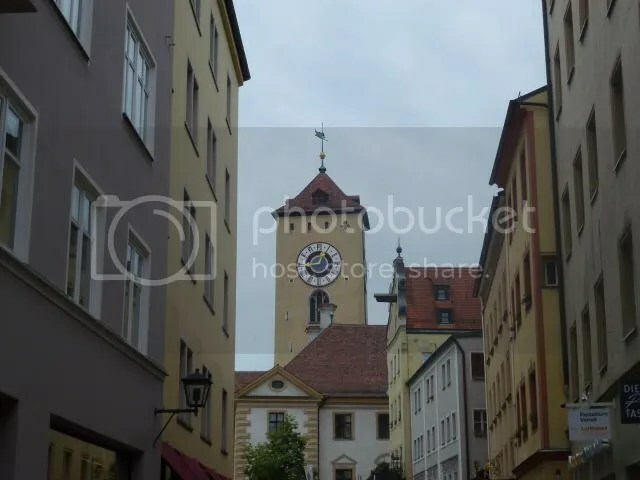 As I say, this is a quiet pedestrian street, but a stag party, with all the attendees in their Sunday best – chequers shirts and Lederhosen – did their best to lift the atmosphere. If you’re not really thirsty, you can get a set of samples. Widespread elsewhere in the world, not so in Germany. The Hefeweisse is true to type. Banana aroma, a hint of citrus. The Dunkel Weisse is rather anonymous. Sweet malt, cereals, sugar. Mild, inoffensive. You don’t have to like beer to drink this, more like a sweet comfort drink. Helles is very pale, with low carbonation. Cereal palate, dull. The Dunkles is the best of the lot. Full malty, but not excessively sweet. Coffee, bread crust. Should you go out of your way for this? Well, it is not likely that you need to go out of you way, as it is smack in the centre of town. But if you are comfortable in one of the other inns or beer gardens of Regensburg, you might as well stay there. The Thick Man is tucked up as side alley, not more than a dozen meters from the busy streets, but you need to know where to look, or you’ll miss it. Pleasantly quiet on a Saturday afternoon. In the front there is a handful of outside tables with some vines giving green cover. And you get a nice shade on this narrow street. Cozy interior, I see from the web site that there is a garden in the back, too. There is even some quite luxurious hotel rooms. This is probably a place for all seasons, and I’ll probably try the food here if I visit again. A very tempting aspargus menu. I start with a Schierlinger Pils. Light and soft, too discreet for its own good. 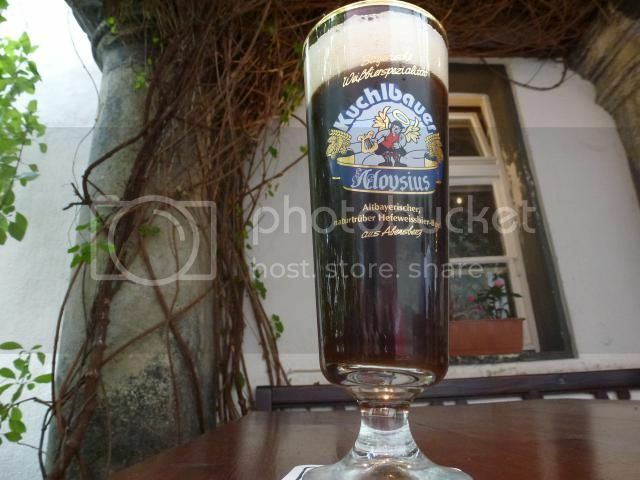 More interesting is the Weissbierbock Aloysius. It is rich, creamy and has the particular blend of banana and sourness that the best wheat bocks have. Malty, yet with a fine balance. Chocolate, yeast. Down at the square, the music has switched to Lieder with accordion. I cannot hear the word, but the tone of voice says it is probably about love long lost. Time to move on. 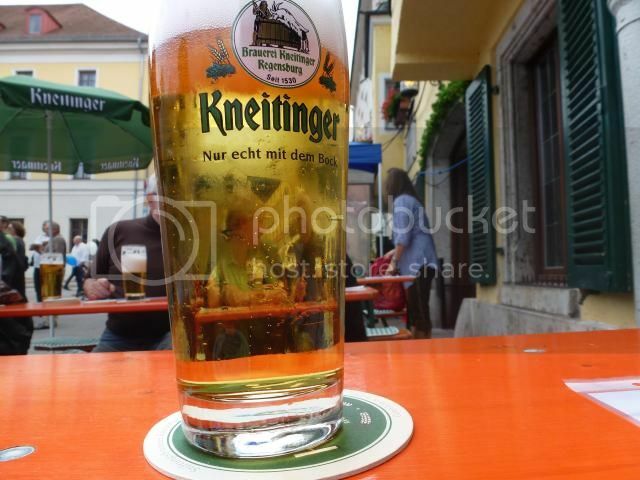 Very centrally located in Regensburg you find the Kneitinger brewery. A bit more than a brewpub, as they have outlets across town, but rather modest dimensions. The brewery tap is a charming old house with a number of small rooms, including a winter garden. When I visited, during the Regensburger Bürgerfest, they has closed off the whole square in front of the brewery, set up benches, chairs and tables and even barbecued a whole ox. A rock band playing and the staff running as fast as they could to cope with the demand for beer. If there ever was a time to make sure they got a turnover in their cellar, this certainly was it. The pils was clear gold, with a fluffy head. Crisp, by no means aggressively hopped, but a fine dryness. Oranges, limes. A really honest beer. A beer to come back to, a Kneipe to come back to on a more quiet day. It is only one in the afternoon, but a number of the younger guests in the Spitalgarten seem to have been here for a few hours, considering their noise level. Well, the whole town of Regensburg is in a party atmosphere. There is a fair on. With wood fired bread ovens, brass bands, barbecues and instant beer gardens. In addition to the regular ones, of course. Regensburg is one of the really stunning medieval German cities that really deserve their place on the UNESCO World Heritage list. The most impressive building is currently undergoing restoration, a stone bridge over the Danube, but there is a makeshift arrangement allowing pedestrians to cross. The Spitalkeller has usually a lovely view over the bridge, but now you mostly see scaffolding. It doesn’t matter that much. There was heavy rain in Munich this morning, but here the sun is shining through. 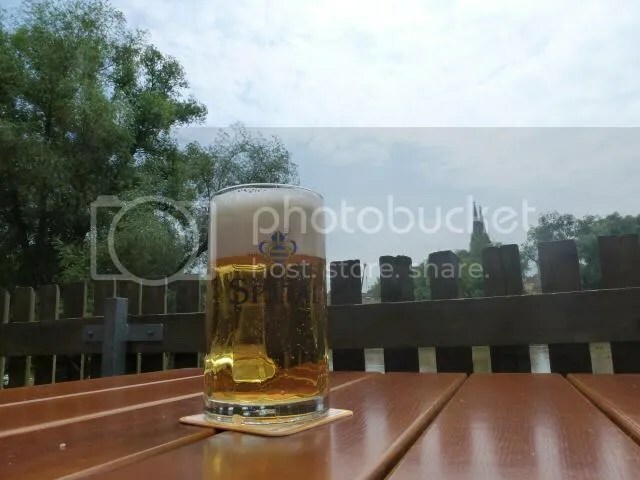 Sparrows and swallows among the trees – and a glass of Spital Helles in my glass. An exquisite blend of grainy goodness and aromatic hops. Clear gold, soft carbonation. A fine showcase for the ingredients. You pick what you want – sunny riverside tables, parasols or light filtered softly through the elm trees. Extensive menu, approximately 45 ways to cook a pig. Dirndl factor zero. Ill fitting uniforms for both waiters and waitresses. But a lovely spot in a lovely town. They have inexpensive rooms to let if you want to spend the night in Regensburg. According to their web site, if you haven’t crossed the Steinerne bridge and vistied the Spitalgarten, you haven’t really been in Regensburg. Bavarian Brews 18 – S-bahn 7, the Munich beer train! So, you have done the walking tour of the Munich inner city. You have visted the Hofbräuhaus and a few beer gardens. You want to get away from the cobblestones for some hours. Take S-train number 6 to Kreuzstrasse, the end of the line. Walk up the hill. Watch out as you cross the busy street. Have a beer or two at the Bartewirt. Return to the railway station. As this is the final stop, the train is most likely waiting at the station. 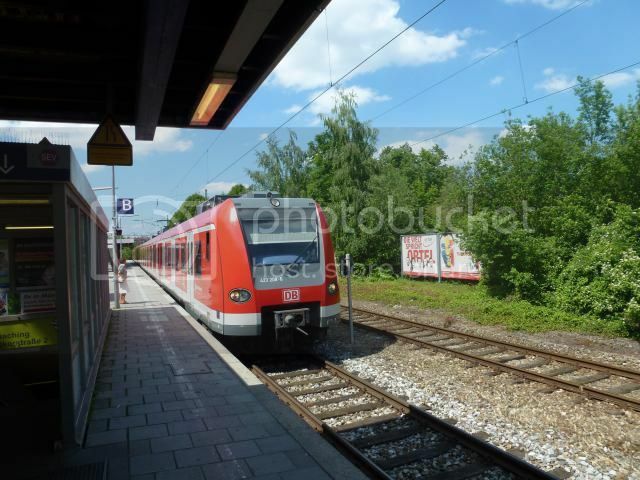 Note that the trains may not be too frequent at this stretch, a timetable or a Munich transport app is handy. The next one is the tricky one, as I never got an answer. There is, supposedly, a brewery near the Großhelfendorf station, too. The Theresienbrauerei. But I never got any answer to my enquries. Maybe you are more lucky. That’s not any serious problem, As Aying is only two stops more along the line, another few kilometers through fields and forests. 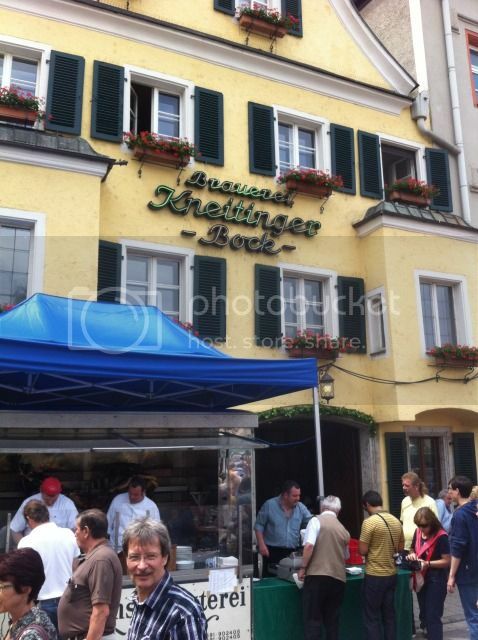 You can walk to the Ayinger Bräustübrl. 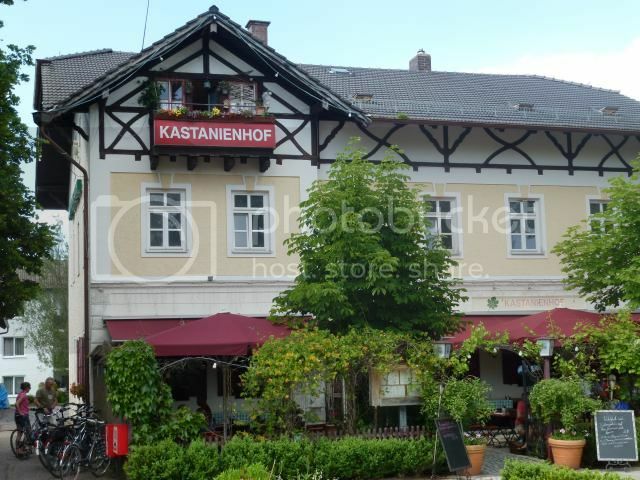 Or you can have the same beers at the Kastanienhof, which is just across the street from Aying station. Leiberheim, with its large, friendly beer garden, is fifteen minutes walks from Neubiberg station. 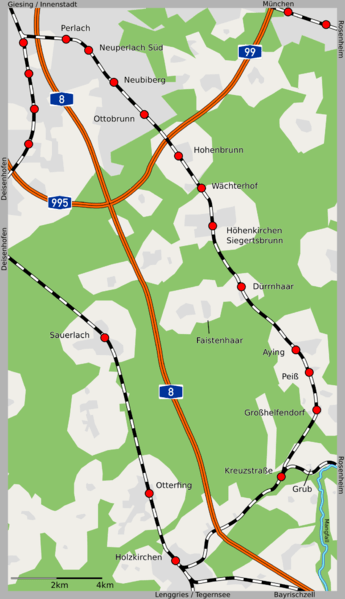 The Forschungsbrauerei is ten minutes from Perlach station. Get off at Giesing and walk towards the Isar river, keeping on the right side of the hill. You’ll soon find yourself outside the Paulaner brewery with its Biergarten.